The inspiration for a sublime landscape design can arrive from many places. Whether it be a childhood experience on a relative’s summer cottage, a remembrance from an exotic vacation, or the reminiscence of an amazing element derived directly from Nature; the components that comprise a holistic picture of an outdoor living space can be conflated to create a unique and singular experience. Designers all have their own unique way of marshalling a client through the design process. Additionally, different people visualize things in disparate ways. Some people respond to texture, some to sound, and others to sight. Some people have trouble seeing in three dimensions, and some can look at an aerial view or plan view and instantly visualize a virtual representation in their mind’s eye. Thus is the challenge for the skilled and astute designer. Fortunately for clients of Platinum Pools, the road to translating landscape design ideas into transcendent landscape architecture is traversed utilizing many different paths. Our adept designers will personalize their specific design to the individual client’s sensory apparatus. Utilizing hand-drawn and colored sketches and renderings, computer-assisted landscape architectural techniques, or state of the art computer-generated 3D modeling in both static and dynamic virtual spaces, our designer ensures that our clients will accurately view, assess, and comprehend the transformation of their outdoor living space during the design process. 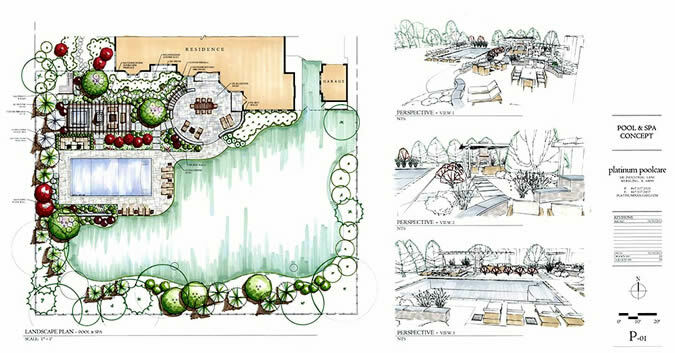 This translates directly into the most accurate representation of the client’s archetypal landscape design.